SAMARITAN’S PURSE CONTINUES WORKING ACROSS THE ISLAND TO HELP BOTH HOMEOWNERS AND CHURCHES REBUILD AFTER HURRICANE MARIA. When Hurricane Maria slammed into Puerto Rico last September, its fierce winds shredded the roof off of Patricio Palermo’s home. His exposed belongings were drenched and destroyed by the pounding rains. Patricio and his family rode out the monstrous storm at a relative’s home. After Maria passed, he drove back to his property, nervous what he would find. His heart sank. His daughter burst into tears. “I lost everything,” he said. Soon after, a Samaritan’s Purse team showed up at Patricio’s house and attached a tarpaulin over the second floor so no further rains could cause additional damage. He thanked our team for their work. Pastor Aida Hernandez of The House of the Fisherman and members of the church reached out to Patricio Palermo and shared the Gospel of Jesus Christ. Pastor Aida Hernandez of the House of the Fisherman and leaders of the church were later in Patricio’s neighborhood and noticed him sitting outside, looking dejected. They approached him and said the church was partnering with Samaritan’s Purse on rebuilds—together they would help fix his house. Patricio had heard those promises before. But, since we tarped his roof, he was open to this second-round help though he remained skeptical. Before long, a Samaritan’s Purse team member came and determined what needed to be done. Not long after that, a dozen church members arrived with tools in hand. Samaritan’s Purse provided all the materials and paid for the labor. Throughout the rebuild, Pastor Aida checked on Patricio and his family. “We presented the plan of salvation and planted seeds, so we’re trusting God as we continue to help and share,” she said. Patricio Palermo said he is thankful we reached out to him and his family—showing and sharing God’s love. 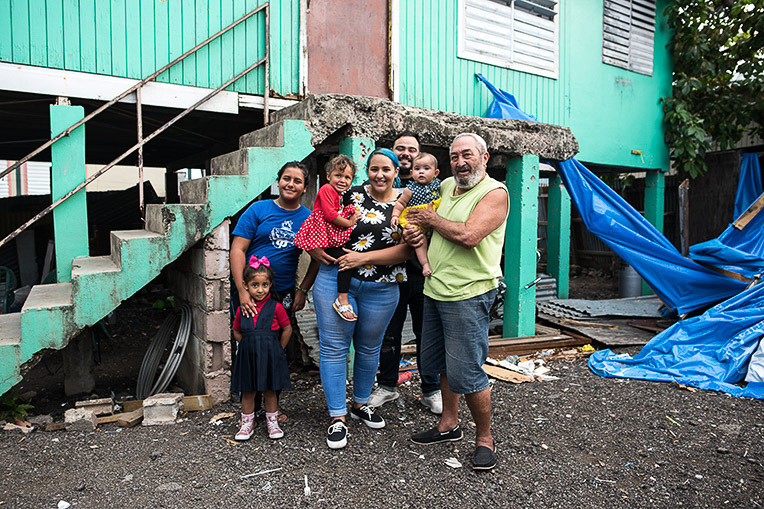 Shortly after Hurricane Maria battered Puerto Rico last year, Samaritan’s Purse responded, deploying people and materials to help residents recover. During the last months of 2017, we distributed over 75,000 tarpaulin; nearly 2,000 generators with 1,500 charging stations; more than 34,000 food boxes; and 24,000-plus water filters. We also mounted a medical response, seeing more than 3,100 patients. 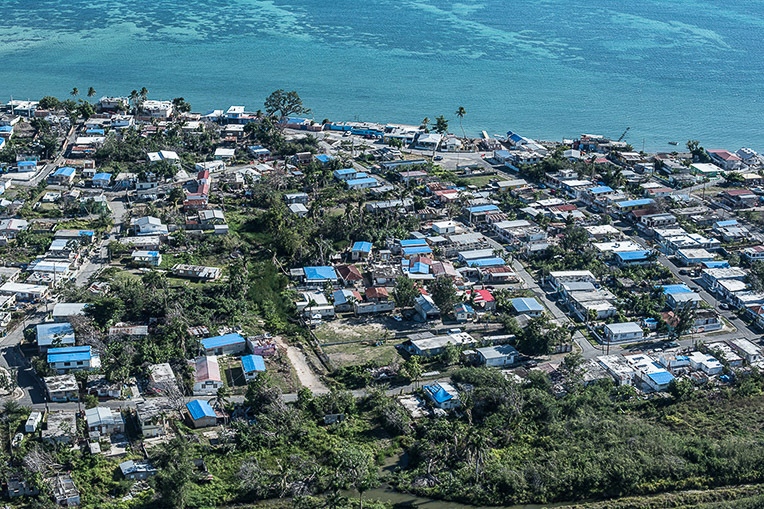 As another hurricane season nears, homes across Puerto Rico still bear the blue roofing tarp that Samaritan’s Purse installed following Hurricane Maria. And, now in 2018, we’re still there, focused on helping islanders, like Patricio, rebuild—their homes and their lives. In addition, we’re coming alongside Puerto Rican pastors to help them rebuild their churches.  Our target is to restore hundreds of homes and a number of churches over this year and next. We’re supplying the materials, but instead of sending an army of volunteers from the U.S., we’re partnering with local churches to supply the manual labor. Pastors, including Anibal Serrano, tell us that our presence on the island has deeply encouraged them. Pastor Anibal shepherds a church outside of Ponce—on the side of a mountain. When he saw how the church roof was blown off, he became distraught. “I felt hopeless. I hit rock bottom,” he recalled. Though their roof was gone, the 100 church members didn’t stop meeting for worship and they reached out to their community, even sharing the Gospel in local prisons. 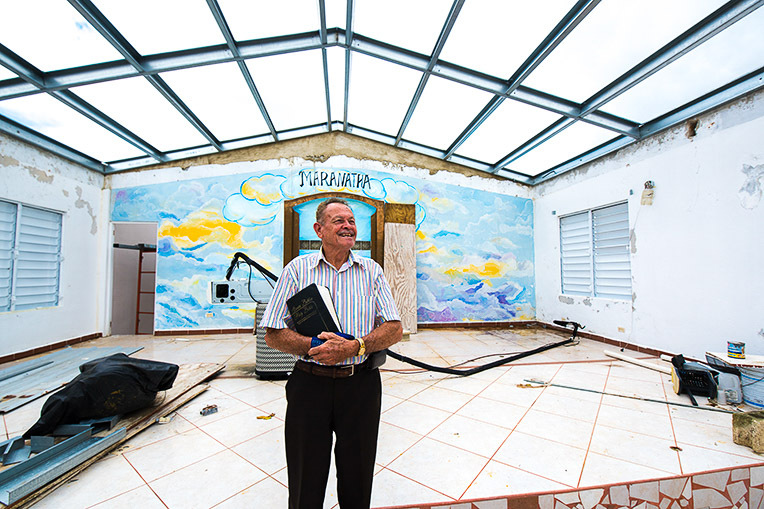 When we told Pastor Anibal we would help rebuild their church, his spirit was uplifted. “God used you to encourage my faith just when I needed it,” he said. The roof has been replaced and the church continues to make a difference for Christ. After Hurricane Maria devastated his church, Pastor Anibal Serrano was ready to give up. He thanks God for using Samaritan’s Purse at just the right time to encourage him. Proclaiming the Gospel is central to our work in Puerto Rico, as it is around the world. 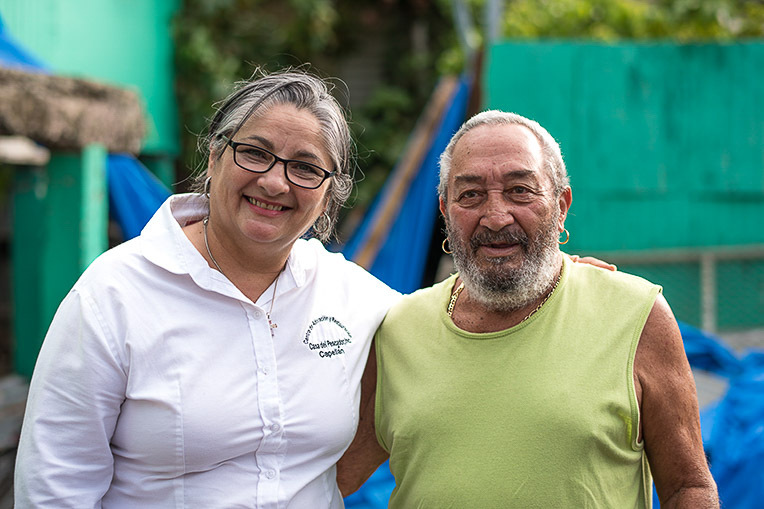 While Angel Luis Rivera and his wife Sylvia huddled in safety at their next-door neighbor’s concrete house, their wooden home was pulverized by Hurricane Maria. For seven months he had to walk two miles to a river to collect water to drink. Relatives helped Luis rebuild his home, but he had no money left to replace damaged appliances, including their stove and refrigerator. After the storm, Luis met Pastor Ramon Rodriguez, who leads one of our partnering churches. Through Pastor Ramon, we provided the family a stove and a refrigerator. On the day Luis picked up the refrigerator at the church, he heard the Gospel and trusted Jesus Christ as his Lord and Saviour. That very day, Luis began helping Pastor Ramon distribute refrigerators to other homeowners in need. We also continue to distribute generators to families who are still without electricity, particularly in remote mountainous locations. One such homeowner is Joanny Berdecia. She suffers from asthma, her husband is experiencing unexplained dizzy spells, and their daughter needs to use a therapy machine for her lungs. Our team, along with Pastor Ramon, delivered a generator to this family. 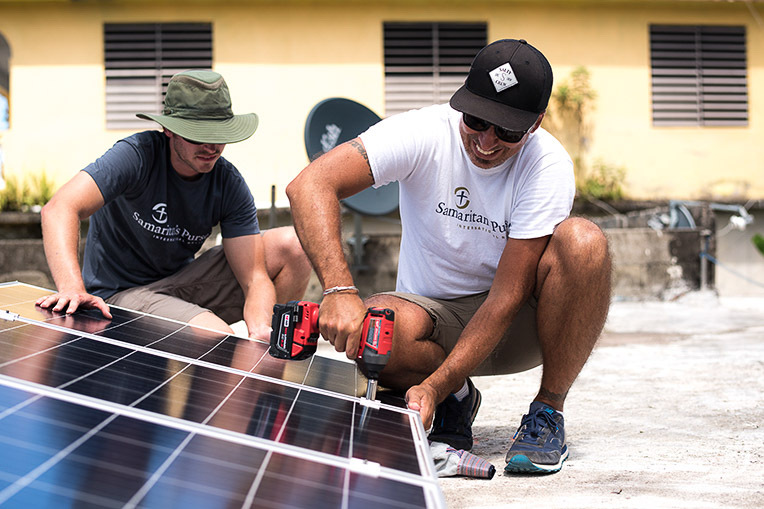 Samaritan’s Purse is installing 100 solar energy relief systems throughout the Yabacoa region on the Southeastern coast—the last municipality to receive electrical power on the island. “I have tears of joy,” Joanny said. “Thank you so much. Everyone in my family will benefit from this generator.” The next Sunday, Joanny attended services as Pastor Ramon’s church. Another component of our work in Puerto Rico is installing 100 solar energy relief systems for households along the southeast part of the island, where Hurricane Maria roared ashore. They will be the last to receive electrical power. But, in the meantime, many senior citizens need their medicines refrigerated. The first family to benefit from this program is that of Cecilia Burgos. Cecilia is 88 years old and has had four strokes and must keep cold, flowing air on her at all times to stay cool. Our team installed four solar panels on her roof and this system provides enough power to run fans and a mini-fridge, which we provided. 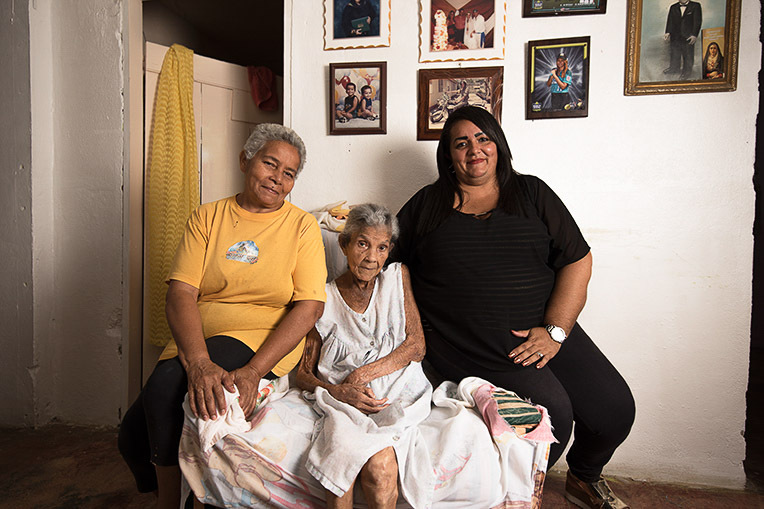 Cecilia Burgos, center, was the first to receive a solar energy relief system at her home. She is joined by daughter Maria Burgos, left, and granddaughter Cecilia Martinez.